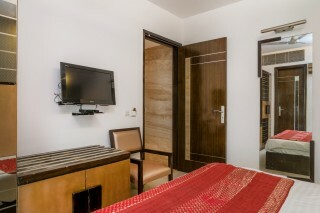 This is an offering of a private room in a boutique stay, which can accommodate up to three people. 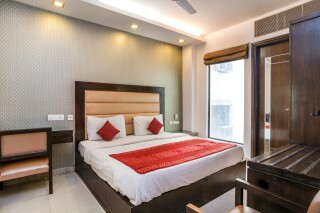 Situated just five minutes away from Karol Bagh Metro Station, this accommodation is ideal for small groups and couples. 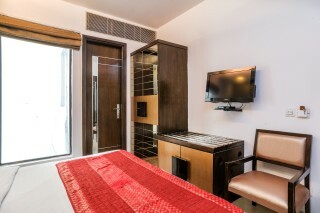 The great location also offers easy access to all of the capital's major tourist attractions, such as Connaught Place, India Gate, Laxmi Narain Temple, Red Fort, Raj Ghat and Jamia Mosque. Breakfast is complimentary here, and parking space is available. Your Space The common sitting area is appointed with a tan chesterfield sofa, a classic sofa set, and coffee tables. The private room on offer sports an accent wall with a fractal pattern and a vitrified tiled floor. It is furnished with a plush double bed with a cushioned headboard, a generous wardrobe, a luggage rack, a flat-screen television for entertainment while indoors, a floor-length mirror for dressing convenience, a writing desk, and a metallic armchair for added comfort. 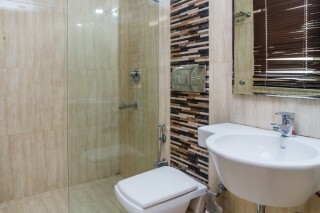 The en suite bathroom is appointed with modern sanitary ware. 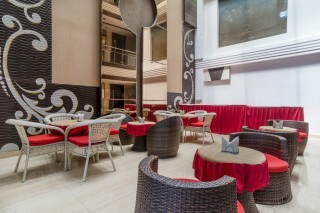 This property is located in the heart of Central Delhi, it is a great property to stay at an affordable price. Metro stations located just 5-10 minutes from this property make it accessible to major tourist attractions such as Connaught Place, India Gate, Red Fort and Jamia Mosque. 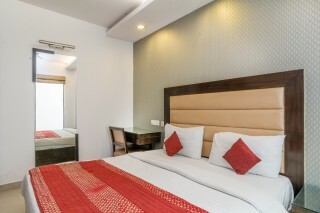 The rooms are large and well maintained and the property has a restaurant which serves all meals. 24 hour room service is available and the other services include, laundry service, free wifi, car rental services and other basic amenities.